Approximately 1500 colored compounds, also known as natural food pigments, have been isolated from foodstuffs. On the basis of their chemical structure, these food pigments can be grouped in the following six classes: heme pigments, chlorophylls, carotenoids, flavonoids, betalains, and miscellaneous pigments. Heme (from the Greek for blood) is the basic chemical structure (Fig. 1) responsible for the red color of two important animal pigments: hemoglobin, the red pigment of blood, and myoglobin, the red pigment of muscles. Practically all the red color of red meat is due to myoglobin, since the hemoglobin is removed with the bleeding of the slaughtered animal. Other colored muscle compounds (cytochromes, vitamin Bi2, flavoproteins) do not contribute significantly to the color of red meat. Myoglobin is a protein that facilitates the transfer of oxygen in muscles. It was the first protein to be fully elucidated with regard to the three-dimensional arrangement of its atoms. Hemoglobin, the oxygen-carrying pigment of blood, is composed of four heme groups attached to four polypeptide chains. FIGURE 1 Structure of heme. The myoglobin in meat is subject to chemical and color changes. Freshly cut meat looks purplish. On exposure to air, the surface of the meat acquires a more pleasing red hue (blooming of the cut). The color change is due to the oxygenation of myoglobin (an oxygen molecule is attached to the heme group in a fashion parallel to the oxygenation of hemoglobin). The oxygenated myoglobin is called oxymyoglobin. When meat is packed in plastic film, the oxygen permeability of the film should be sufficient to keep the myoglobin oxygenated. 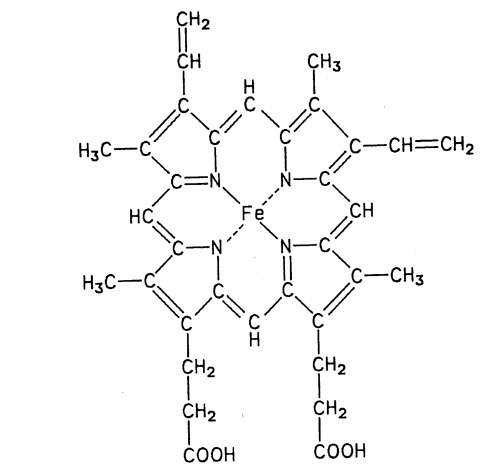 In both myoglobin and oxymyoglobin the heme iron is in the Fe2+ form. 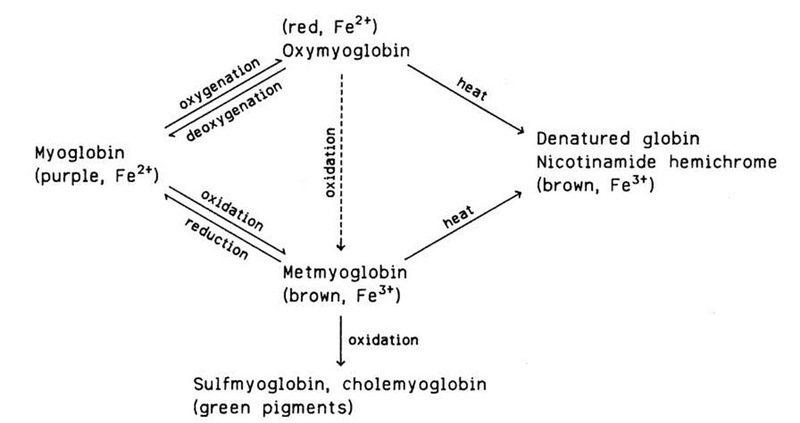 In the presence of oxygen, myoglobin is eventually oxidized to brown metmyoglobin, in which the heme iron is in the Fe3+ form. Both the oxygenation and oxidation processes are reversible. Severe oxidative deterioration may result in the formation of green pigments (sulfmyoglobin, chole-myoglobin). When meat is cooked, the protein moiety (globin) of myoglobin is denatured and the heme is converted chiefly to nicotinamide hemichrome, the entire pigment acquiring a brown hue. These changes are irreversible. Heated meat is also subject to the browning reactions discussed in Section III. A simplified scheme of the red-pigment changes in fresh and heated meat is shown in Fig. 2. In cured meats, in which nitrite is used, many reactions occur, some of which lead to color changes. Among the established reactions are the following: (1) the nitrite salt is converted to nitric oxide (NO), nitrate, and water; (2) the NO replaces the H2O attached to the iron of heme and forms nitrosyl myoglobin, which is reddish; (3) on heating, the nitrosyl myoglobin is transformed to nitrosyl hemochrome, which has the familiar pink color of cured meats; and (4) any metmyoglobin present in the cured meat is similarly nitrosylated, reduced, and finally converted to nitrosyl hemochrome. Several chlorophylls have been described. Two of them, chlorophyll a and chlorophyll b, are of particular interest in food coloration because they are common in green plant tissues, in which they are present in the approximate ratio 3:1, respectively. Their structures resemble that of heme since they are all derivatives of tetrapyrrole. An important difference is that the central metal atom is iron in heme and magnesium in the chlorophylls. Another difference is that the pyrrole unit IV in the chlorophylls is hydro-genated. In addition, the chlorophylls contain a 20-carbon hydrophobic "tail," the phytyl group (Fig. 3). The chlorophylls are located in special cellular bodies, the chloroplasts, where they function as photosynthetic agents. As food pigments, chlorophylls impart their green color to many leafy (spinach, lettuce, etc.) and nonleafy (green beans and peas, asparagus, etc.) vegetables and to unripe fruits. They are not very stable pigments, however. Ethylene, a gaseous plant hormone, destroys chlorophylls, and it is occasionally used to degreen fruits. The acids naturally present, formed, or added to plant tissues during food processing convert the bright green chlorophylls to dull olive brown pheophytins by replacing the magnesium of the molecule with hydrogen. Unfortunately, no fail-safe procedure has been proposed for preventing this discoloration in heated and stored green vegetables. Freezing storage is an effective method of preserving the green color of vegetables. Many of the yellow, orange, and red colors of plants and animals are due to carotenoids, pigments similar to those of carrots. The basic structure of carotenoids is a chain of eight isoprenoid units. Certain isoprenoid derivatives with shorter chains (e.g., vitamin A) are also considered carotenoids. Most of the structural differences among carotenoids exist at the ends of the chain. Some carotenoids are hydrocarbons and are known as carotenes, while others contain oxygen and are called xanthophylls. The structures of several carotenoids, along with the foods or tissues in which they are present, are shown in Table I. Because of the numerous double bonds in the carotenoid molecule, a large number of cistrans isomers are theoretically possible. The carotenoids of foods, however, are usually in the all-trans form (Table I). Trans to cis transformation is possible and is accelerated by heat, light, and acidity. Carotenoids occur free or as esters of fatty acids or as complexes with proteins and carbohydrates; for example, in paprika, capsanthin is esterified with lauric acid. In live lobster, astaxanthin is complexed with protein; the astaxanthin-protein complex is blue-gray, the color of live lobster, but on heating, the complex is broken and the freed astaxanthin imparts its red color to the cooked lobster. Carotenoids are present in a large variety of foods, from yeast and mushrooms, to fruits and vegetables, to eggs, to fats and oils, to fish and shellfish. As fat-soluble substances, carotenoids tend to concentrate in tissues or products rich in lipids, such as egg yolk and skin fat, vegetable oils, and fish oils. Plants and microorganisms synthesize their own carotenoids, while animals appear to obtain theirs from primary producers. In the development of many fruits (e.g., citrus fruits, apricots, tomatoes) ripening is associated with the accumulation of carotenoids and the disappearance of chlorophyll. The intensity of the yellow color of certain animal products, such as egg yolk and milk fat or butter, depends on the carotenoid content of the feed the animals ingest. In view of this dependency, the seasonal variation in the color of these products is understandable. A nutritionally important interconversion of carotenoids is the formation of retinol (vitamin A) from j-carotene and other carotenoids possessing a j-ionone ring and known as provitamins A. 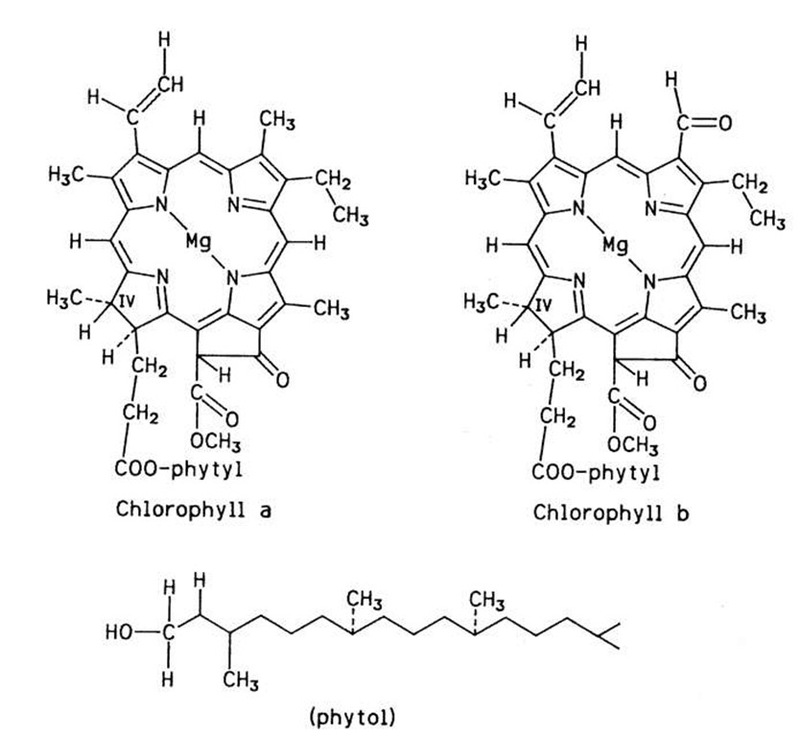 FIGURE 3 Structure of chlorophylls a and b. FIGURE 2 Pigment changes in fresh and heated red meat. The stability of carotenoids in foods varies greatly, from severe loss to actual gain in carotenoid content during storage. Carotenoid losses amounting to 20 or 30% have been observed in dehydrated vegetables (e.g., carrots, sweet potatoes) stored in air. These losses are minimized when the dry product is stored in vacuum or inert gas (e.g., nitrogen), at low temperatures, and protected from light. The main degradative reaction of carotenoids is oxidation. Oxygen may act either directly on the double bonds or through the hydroperoxides formed during lipid autoxidation. Hydroperoxides formed during enzymatic lipid oxidation can also bleach carotenoids by a coupled lipid-carotenoid oxidation mechanism. On the other hand, certain vegetables, such as squash and sweet potatoes, in which carotenoid biosynthesis continues after harvesting, may manifest an increase in carotenoid content during storage.